Power, eloquence, a virile technique and a compelling artistic vision mark the playing of pianist Yakov Kasman, Silver Medalist at the Tenth Van Cliburn International Piano Competition. This event – Mr. Kasman’s American debut – was the culmination of several piano competition triumphs and tours in Europe and the Middle East, including a top prize at the Arthur Rubinstein Competition in Tel Aviv and second prize at the International Prokofiev Competition in St. Petersburg. Yakov Kasman has performed hundreds of concerts throughout the United States, Russia, France, and Asia, including recitals in Los Angeles, Philadelphia, Cleveland, and at the Tonhalle in Zurich. He has appeared as soloist with dozens of symphony orchestras, among them the Buffalo, Oregon, Pacific, Syracuse, Memphis, Miami, Ft. Worth, Nashville and Alabama symphonies, the Moscow Philharmonia Orchestra, the Athens State Orchestra, Orchestre de Lille, Singapore Symphony, National Symphony Orchestra of Taiwan, Orquestra Simfonica de Baleares in Spain, and the Daejeon Philharmonic Orchestra (South Korea). Born in the town of Orel, near Moscow, Mr. Kasman began his piano studies at the age of four. A graduate of the Tchaikovsky Moscow Conservatory (followed by a professorship of piano at the Music College of the Conservatory), he is now Professor of Piano and Artist-in-Residence at the University of Alabama, Birmingham. Mr. Kasman’s debut in America in 1997 as Silver Medalist in the Tenth Van Cliburn International Piano Competition in Fort Worth was the culmination of several competition triumphs and tours in Europe and the Middle East, including prizes at the 1991 Valentino Bucchi Competition in Rome, the 1991 London World Piano Competition, the 1992 Artur Rubinstein International Competition in Tel Aviv, and the 1995 International Prokofiev Competition at St. Petersburg. Since his American debut, he has given concerts in the United States, South America, Europe, Russia and Asia, including recitals in New York City, Boston, Los Angeles, Philadelphia, Cleveland, St. Louis, Kansas City, St. Paul, Atlanta, Birmingham and Washington, DC. He has appeared as soloist with more than fifty orchestras including the Buffalo, Oregon, Pacific, Syracuse, Memphis, Miami, Ft. Worth, Nashville and Alabama symphonies, Athens State Orchestra, the Orchestre de Lille and Orchestre Philharmonique de Montpellier in France, the Singapore Symphony, the National Symphony Orchestra of Taiwan, Orquestra Simfonica de Baleares (Spain), Daejeon Philharmonic Orchestra (South Korea) and the Moscow Philharmonia Orchestra. Born in the city of Orel, near Moscow, Mr. Kasman began his piano studies at the age of five. 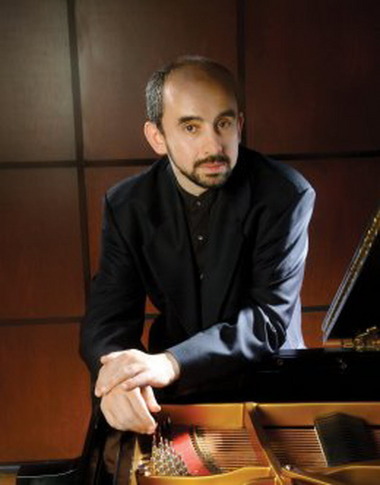 A graduate and postgraduate of the Moscow Conservatory and previously a professor of piano at the Music College of the Conservatory, he is now Professor of Piano and Artist-in-Residence at the University of Alabama, Birmingham. His students are winners of regional and national competitions. “…pyrotechnics came from Russian pianist Yakov Kasman, who illuminated his performance of Beethoven’s “Emperor” Concerto with electrifying energy and sparkling tonal colors and followed the piece with a brittle, crackling march from “Love for Three Oranges,” by Prokofiev. “At 6 p.m. Sunday the phone rang with the news every symphony manager dreads…. At noon Monday, Yakov Kasman’s phone rang in Birmingham, Ala. Calmer was on the line, asking if the 37-year-old Russian could play the Rachmaninoff concerto in Portland that night. Kasman, who won the silver medal in the 1997 Van Cliburn International Piano Competition, was just about to begin a day of teaching at the University of Alabama. He’d never been to Portland, had never met Kalmar and had never played a concerto without a rehearsal. And this was Rach 3. He hadn’t played a note of it since March. Kasman didn’t hesitate. He would take the risk. Within minutes of hearing that Kasman had agreed, the Oregon Symphony’s communications department began sending e-mail messages to 10,000 symphony friends, started calling 1,000 Monday ticket holders and began preparing press releases for five radio stations, four TV stations and local newspapers. Eight hours before the concert, Kasman’s wife drove him to the airport. He wolfed down chicken and pasta in the car – the last food he’d have for 10 hours. During the long hours in the air, Kasman went over the Rachmaninoff score in his mind. He had trouble remembering even which octave the main theme started in. He gave up in frustration. Kasman’s plane touched down in Portland at 7 p.m. Curtain was an hour away. Calmer drove him straight to Schnitzer Hall. Immediately, Kasman went to the piano, sitting in the dark backstage. He seemed utterly focused. He talked to no one. He avoided eye contact. He played for seven minutes, then huddled with Kalmar to go over tempos and transitions. At 8 p.m., [Mr.] Welch, one of 2,354 expectant listeners, sat in row L of the balcony, mopping his brow. His friend had called him at work that afternoon, saying the symphony had found a soloist. Welch was skeptical. He’d never heard of Kasman, and he knew the Rach. Nonetheless, he dashed home, showered and changed. It was crunch time. The stage manager gave the cue. Kalmar patted Kasman on the back and gave him a hug. Kasman, a small, compact man with a neatly trimmed beard, walked toward the Steinway concert grand piano. The audience, aware that the pianist had just landed in Portland, greeted him with a surge of applause. Kalmar raised his baton and the orchestra entered. Kasman, keeping his eyes fixed on the conductor, lowered his hands to the keys. From the first notes, Kasman sailed through the music, playing the massive chords with voluptuous tone and even inserting a playful quip now and then. He missed a few notes at the top of some breakneck leaps, but nothing that disturbed the music’s texture. Most extraordinary, his playing transcended the notes, difficult as they were, and took on the natural, assured quality of a storyteller enjoying his tale. The final, thundering chords had him standing straight up off the bench.